Russell Brand introduced the Dalai Lama during a youth event in Manchester yesterday and admitted he was finding the experience somewhat surreal. Acting as master of ceremonies for his holiness’s Century of Dialogue – Stand Up and Be The Change talk, Russell Brand, 37, was praised by the spiritual leader for his “openness”. Introducing the free event at Manchester Arena, which was attended by several thousand under-25s, Russell Brand introduced the Dalai Lama, 76, in a frank and honest speech. The comedian said: “Going from junkie to Shagger of the Year…three times… to now introducing the Dalai Lama. It has been an interesting journey. 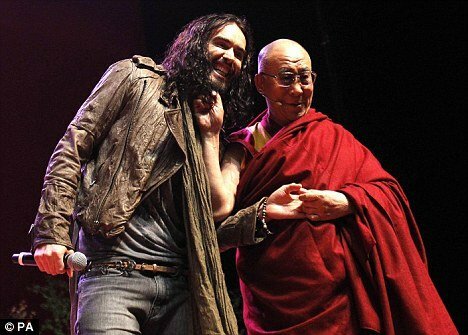 Russell Brand jokingly asked the Dalai Lama if had picked up any spiritual tips. The two men went on to discuss their contrasting sleeping pattern, with Russell Brand more of a night owl and the Dalai Lama as an early riser. But the comedian found himself lost for words when the Dalai Lama admitted that while his sleep patterns weren’t affected by different time zones he travelled in, his bowel movements were. The Dalai Lama is currently on a 10-day tour of Britain and is appealing to the young to foster a culture of non-violence and global peace in 2012. His Holiness is promoting his new online film Stand Up And Be The Change – shot by Rankin – which features the Gorillaz, Tilda Swinton, Stella McCartney, Willem Dafoe, Beth Ditto, Jarvis Cocker, Alison Mosshart, Michael Stipe and Grimes. Kim Kardashian on Oprah's Next Chapter: "I was in such a deep depression"